Panorama Edge Villa is located in the same private area of Panorama and Oceania Villas, at the Edge of Peyia Hills in Paphos. 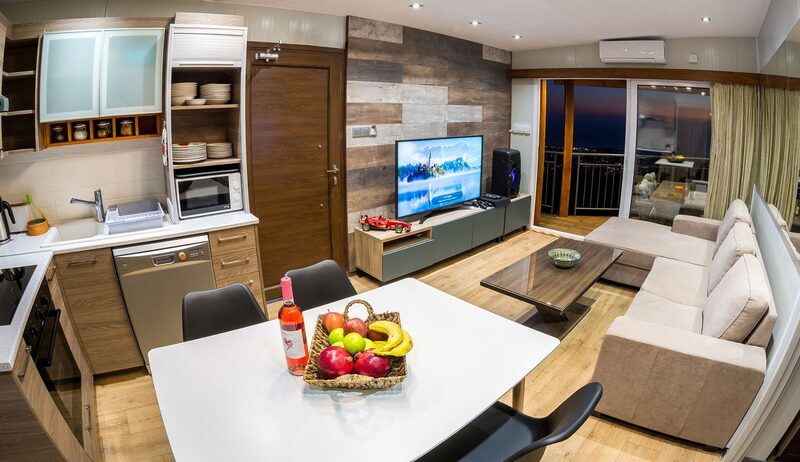 This is a unique modern modular villa, constructed with such details and elements of which are concurrent with the open environment and the endless coastal views. Its delicate design and equipment fulfil all the needs of every guest. The combination of this villa with its luxury neighboring villas Panorama and Oceania allows the accommodation of a larger group of guests. Panorama Edge can work as an individual villa to have relaxed holidays, as it is a perfect gateway for restoring and recalibrating yourself. 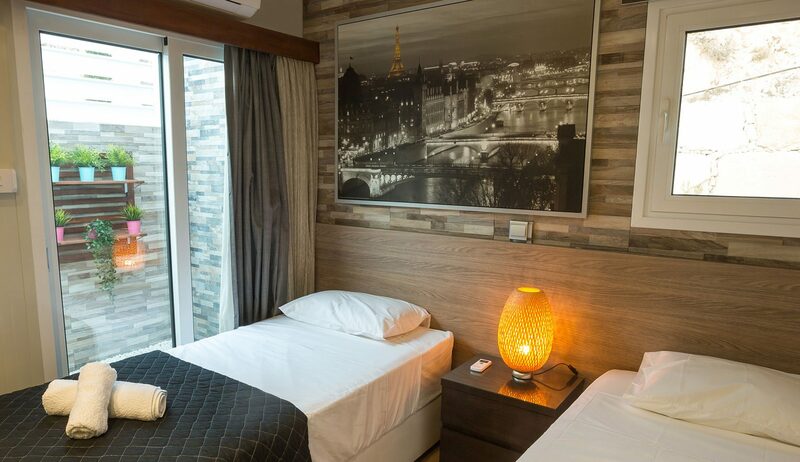 It is ideal for couples who wish to spend some romantic moments away from the noise of the city or for a family who wish to enjoy some holiday time with their loved ones. Everyone needs that quality from time to time, and Panorama Edge offers plenty of it. Designed with a contemporary style and in harmony with the surrounding environment and the coastal views, this pre-fabricated villa, as if floating over the ground, is a truly one of a kind retreat. 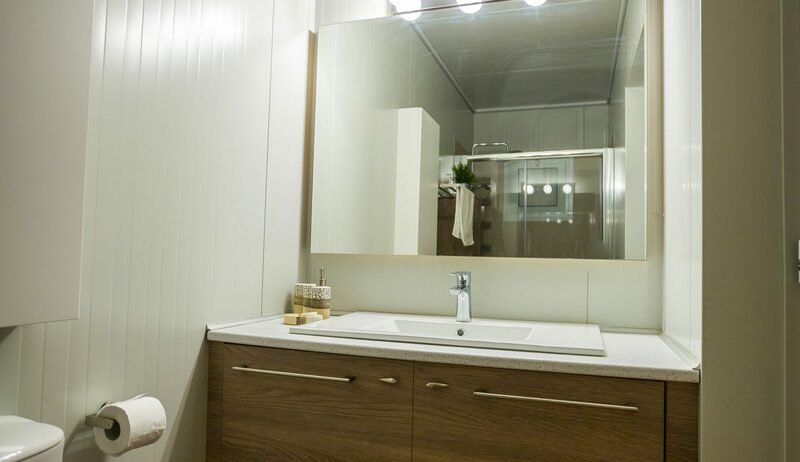 This modular villa has one master bedroom with en-suite bathroom, 1 twin bedroom, an extra common bathroom, a luxury kitchen, a cosy living room and an outdoor hot tub Jacuzzi with complete privacy to enjoy the most intimate moments. 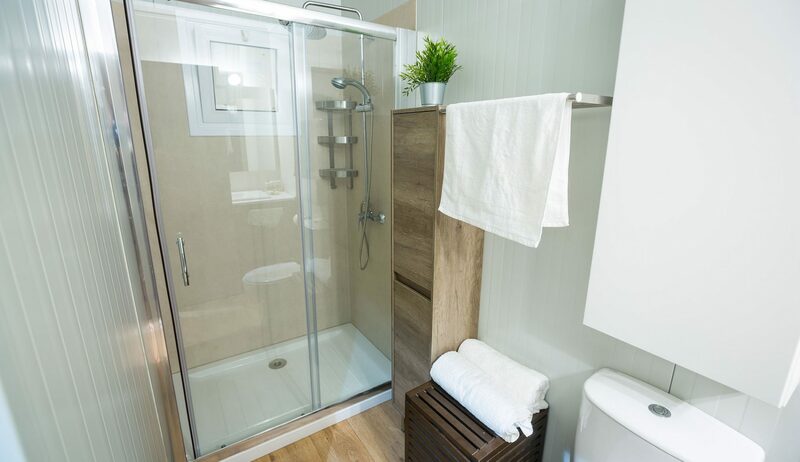 The master bedroom with ensuite shower room offers complete privacy to the couples, while the twin bedroom with 2 large single beds is perfect to cosy up in your own world of dreams. The natural light dominates the rooms, as the large glass doors let you enjoy the panoramic view with your favourite drinks. To further heat-up the things, the main bedroom opens the access to the outdoor Jacuzzi that is an epic detail of Panorama Edge. 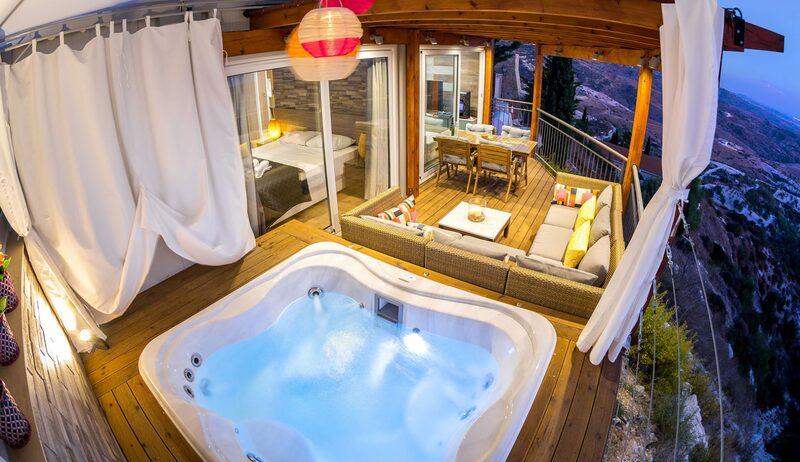 It is built on the edge of the mountain cliff and with the wooden raising floor, it offers the guests total luxury and privacy. 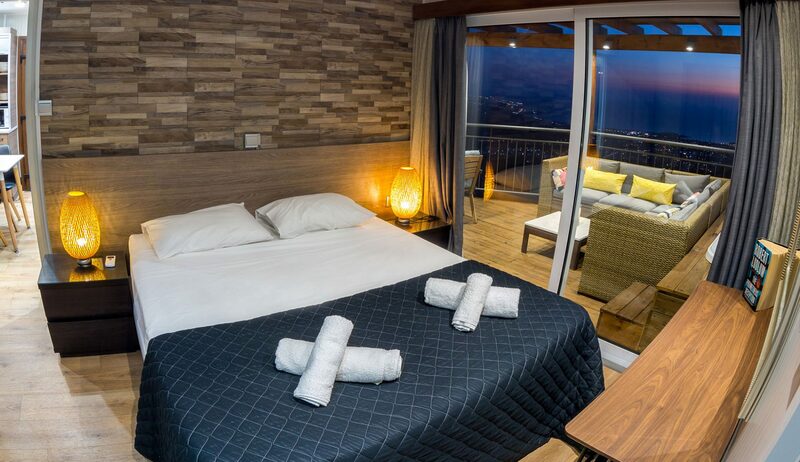 Guests can enjoy the Mediterranean Sea view and the panoramic view of Paphos from the living room as well. The room is an open plan as the luxury kitchen is combined with it. For anyone interested in entertainment can lounge on the large comfortable sofa and enjoy their favourite show on the large TV with Hi5 sound system or play PS4. The Panorama Edge offers complete satisfaction to people of all ages. This cosy villa provides the nature's view from all sides. Whether sitting in the living room, relaxing in your bedroom or having your feast in the balcony. 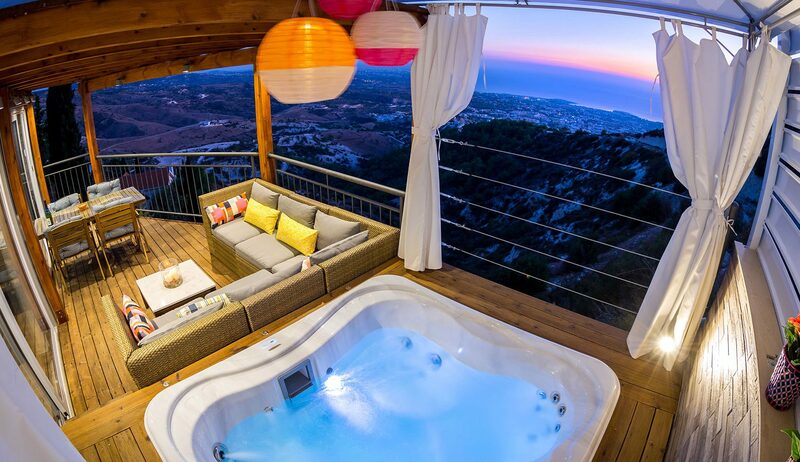 Moreover, guests can relax by having drinks or eat in the balcony while cherishing the spectacular view of Paphos. A very interesting thing about the balcony is that it feels like hanging at the edge of the cliff and you can fill yourself with the beauty of nature. Traditional BBQ (foukouk) is situated outside, a mandatory key to making the accommodation more exceptional as the guests have the chance to cook their own grill food. 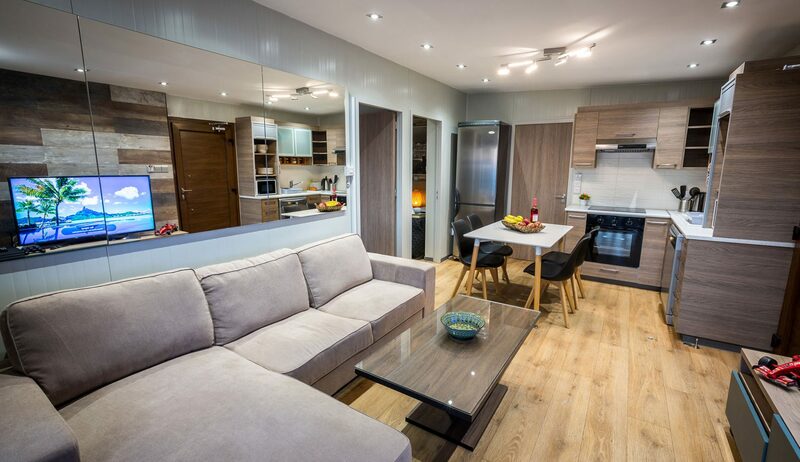 The open plan kitchen is equipped with almost all kitchen appliances to make you feel 'at home'. 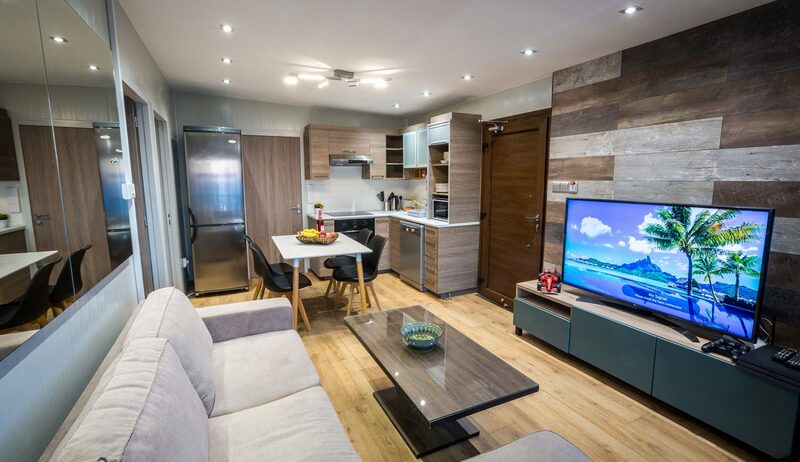 From the use of material to the exceptional design that allows maximum natural light to come in, the high ceiling and the flawless connectivity with the outdoors, Panorama Edge is all about luxury and romance. Adjusted to Villa Panorama and Oceania, it makes a wonderful honeymoon suite for the newlywed. You can combine Panorama Edge with the villas to accommodate more guests. The combination will now sleep up to 36 guests. Moreover, it offers a perfect escape for the bride and groom when they want to spend the best of romantic moments after the celebrations with family and friends. Fully air-conditioned for both cooling and heating . The use of the Jacuzzi is FREE. One baby cot and a high chair are available free of charge upon request. Only the number of guests specified on the booking form may be accommodated at the villa. Please note a refundable security deposit of 200 GBP/EUR is required to be paid by cash on the day of accommodation. The fabulous villas Panorama and Oceania are located just a few kilometres from the town of Paphos, once the island�s ancient capital city, situated on the southwest coast of Cyprus. The district boasts a varied mixture of historical sites, modern tourist attractions, a delightful year round sub-tropical climate, and is the ideal destination for visitors of all ages. 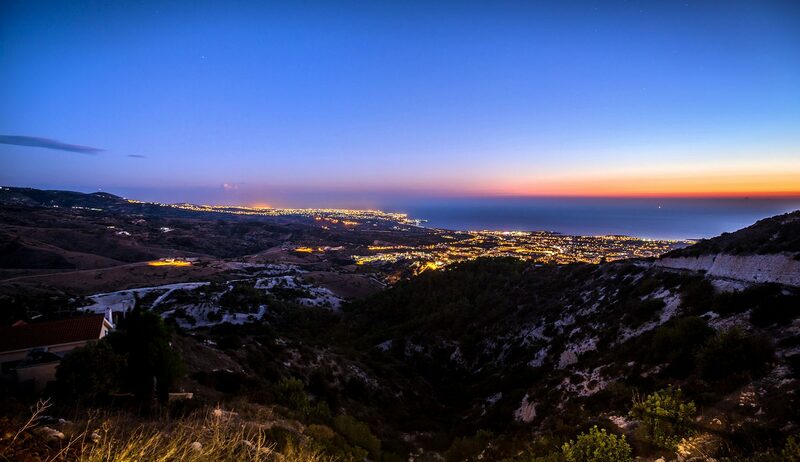 Paphos town and the nearer Coral Bay, offer night life with clubs and bars, traditional taverns, contemporary international restaurants, scenic rugged country side and magnificent sun kisses beaches. 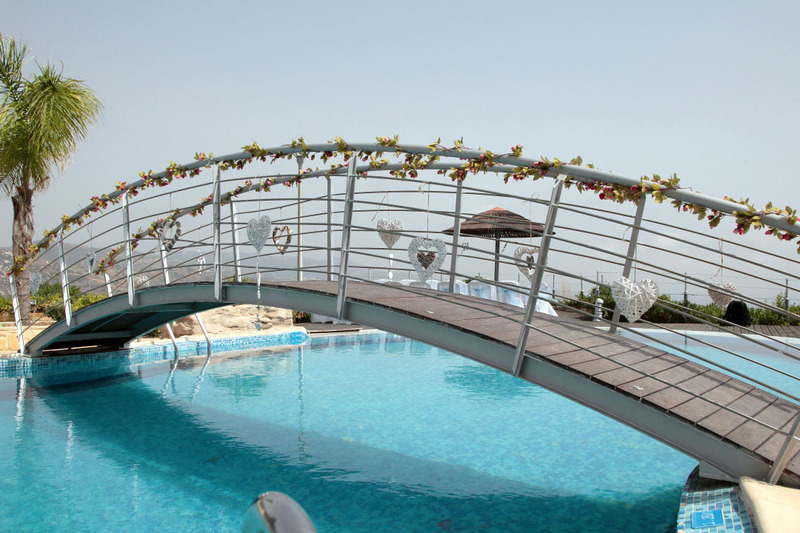 Known as the Island of love, Cyprus and particularly the Paphos area is your perfect wedding and vacation destination. Panorama and Oceania villas are majestically located in the private and rural Peyia Hills region above the resort of Coral bay and enjoy spectacular costal views making them suitable for intimate weddings and secluded holidays. 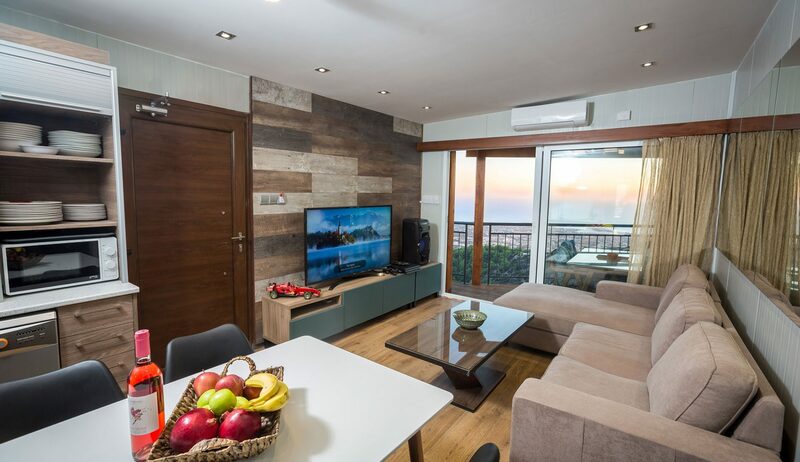 Guests choosing to stay in these luxurious villas will be treated to stunning views of the Paphos locale including the town, the wild beauty of the Akamas nature reserve, sandy beaches and sea caves coast. These adjacent villas are idyllically situated between picturesque Kathikas village and bustling Peyia, and a few minutes from the Pikni pine forest where you can enjoy a traditional BBQ or picnic prepared by our catering team. The villa is also situated approximately 25 minutes way from Polis and Latsi cities. Peyia village which is just an 8 minute drive from Panorama and Oceania, offers excellent facilities including supermarkets, fashion shops, pharmacies, banks, bars, traditional tavernas, and old style coffee shops known as Kafeneia where the villagers can be seen playing �backgammon� (Tavli), one of the oldest table games of Cyprus. Venturing just 10km from the villas, past the village of Peyia you will find the tourist area of Coral Bay, which hosts a variety of trendy and traditional bars, restaurants, shops, rentals (bike, car or motorbikes), and travel agencies. 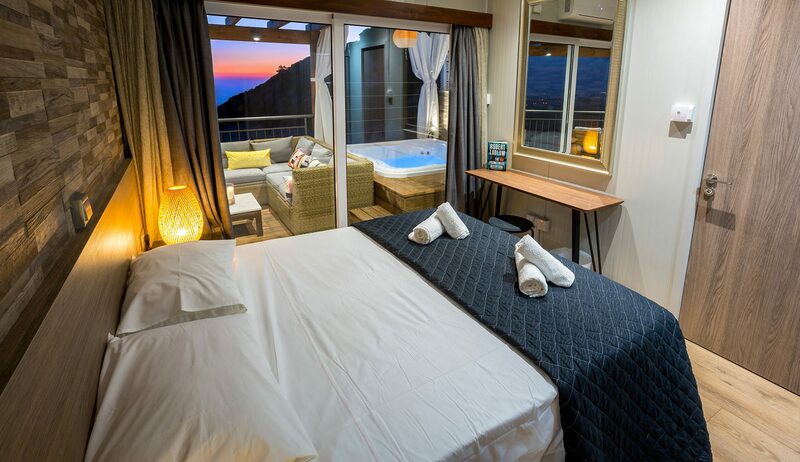 Facilities also include easily accessible sandy beaches with off road parking, a Horse Riding School, a Mini-golf centre, a Snooker Hall, Go-Carting, Water-sports, Scuba diving schools, Spas, and Paphos Zoo. These beaches offer golden sand, water sports, sun-beds, umbrellas and life guards. Cafes are situated next to the beaches providing all types of refreshments and snacks. Both of these beaches are ideal wedding photography locations for �trash the dress� or romantic beach shots, especially at sunset. For those who seek a more tranquil experience, the Akamas Peninsula, a masterpiece of unspoiled landscape, lies at the northwest tip of the island. As an area protected by UNESCO, it is one of the richest bio-diverse wild regions of the island, with amazing flora and fauna including a native turtle breeding area. The region is uninhabited, wild and famous for its geological formations. The jagged sea coast, formed by ancient volcanic activity, comprises hidden caves and bays including the �Blue Lagoon� with its crystal water ideal for underwater or �trash the dress� wedding photographs. It is the perfect place for exploration, either by foot, jeep or motorbike. Exciting activities can be enjoyed, such as jeep or quad-bike safari, canoeing, kayaking, hiking along the Avakas Gorge which is 3km long and rises to heights of 30m, or relaxing on the unspoiled Lara (turtle) beach. 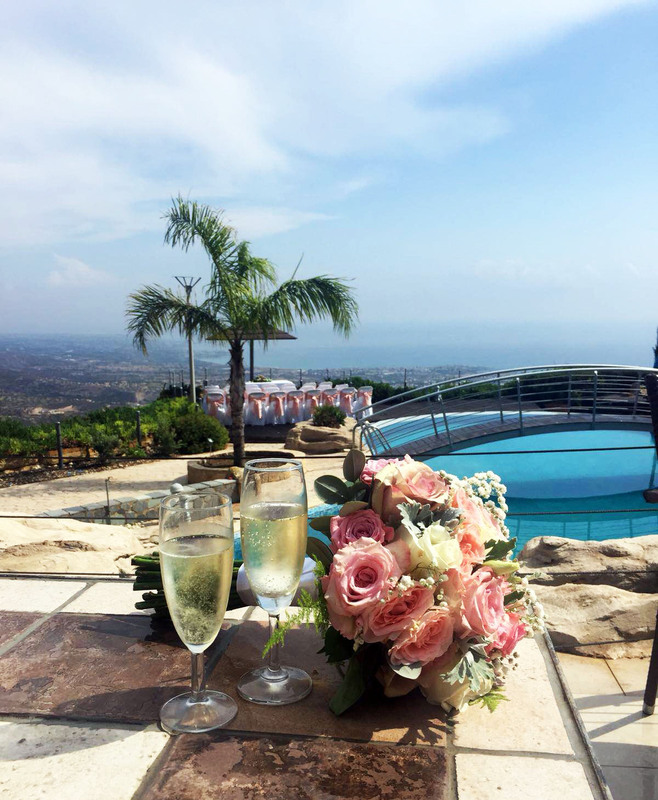 The Panorama wedding services team is able to organize visits to the area or any other excursions on your behalf. A remarkable place to visit on the northern edge of the Akamas Peninsula is �Aphrodite�s Baths�, where, according to legend, the Greek Goddess used to bathe. This beautiful and unique area of Cyprus, accessible on foot and by motor vehicles, has a natural exotic environment providing the opportunity to see and observe these natural fresh water baths within a hidden paradise. Upper Paphos town is approximately 20km away from Peyia village, and has designer shops local businesses and fascinating museums within the ancient upper town. Lower Paphos has recently seen the building of a modern well equipped Kings Avenue Mall just a few minutes drive from Paphos Harbor with its medieval historic port, ancient Roman mosaics and 2nd century odeon in the UNESCO archeological complex. Close by are Aphrodite Water Park and a second archeological site known as the Tombs of the Kings. Please view the map for Location details and places of interest. Located at the top of Peyia Hills- of Paphos Cyprus in a private and rural region towards the stunning Mediterranean sea view. Aphrodite's Baths (near Akamas): Exotic environment, Opportunity to see and observe these natural fresh water baths. Paphos Center (22 Km away): Medieval Port, Kings Avenue Mall,Museums, Nightlife,Archaeological Sites, Restaurants, Aphrodite Water Park. We were a group of 11 friends and our experience was great. Sevinos the owner is super friendly and helpful, feels like one of the friends. The Villa itself is exceptional and beyond our expectations, a lot of space, clean, fully equipped and the view is outstanding. 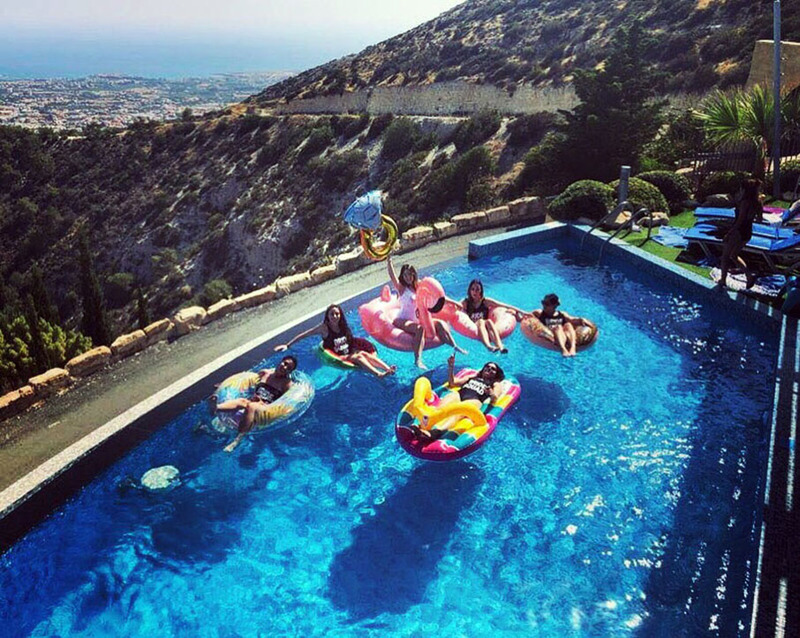 My friends and I stayed at both villas for a week following our wedding in Cyprus. We didn’t want to leave! It was the perfect location. It’s like having your very own choice of venues to host parties in. The views are incredible and the villas are both beautiful. We have just returned from our Family holiday & our wedding. We all had an amazing time here! So we are all suffering from Villa blues right now but still on a high from a great week with family & friends. Oceania Villa is beautiful, spacious with spectacular views of Peyia, Coral Bay & Kissonerga, day & night. The pool is perfect! Everything is perfect! The bedrooms were great, bathrooms are huge. The two kitchens were so handy when it came our wedding cake which was baked in the villa. The open plan living room, pool & BBQ areas made socializing so easy, music just flowed through the villa but you could still find a quite spot for a private conversation. Our wedding meeting was held in the Honeymoon suite bathroom! All 9 of us sat in there and worked out positions (fun memory), that’s how big it is! Having our Wedding reception here was the best decision. 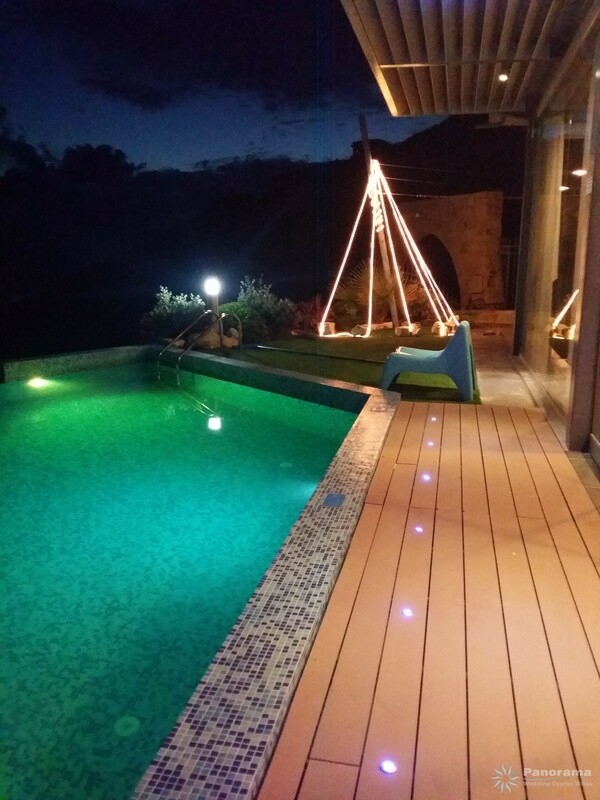 Our guest were in owe of the location, views and villa itself. Enough space for our 46 guests to sit, eat, relax, dance, get changed & swim. The pictures look amazing and everyone said it was a magical memory they will never forget. Poly & Sevinos were brilliant! So helpful with anything we needed from the first point of contact until we sadly had to leave the villa. Thank you guys for everything! We definitely hope to stay here again in the near future. Amazing experience, magical memories and a wonderful time had by all. We had our wedding at the villas in June 2018. All of our guests stayed at the villas, and it was the most beautiful and perfect event that we could have wished for. Polly was the most amazing host, and nothing was ever too much to ask for. We had 24 guests in total, staying in the Panorama and Oceania Villas. 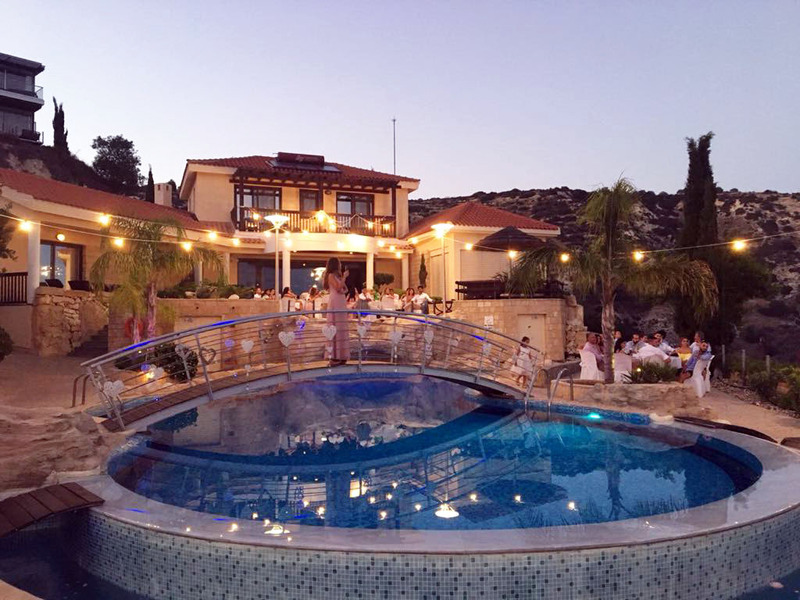 If you’re planning a special occasion, family holiday, or wedding, Panorama and/or Oceania is definitely the place to do it….And Lakis is a great wedding planner! It was a wonderful week and we will most certainly go there again for a group holiday. Thank you, Polly and team. 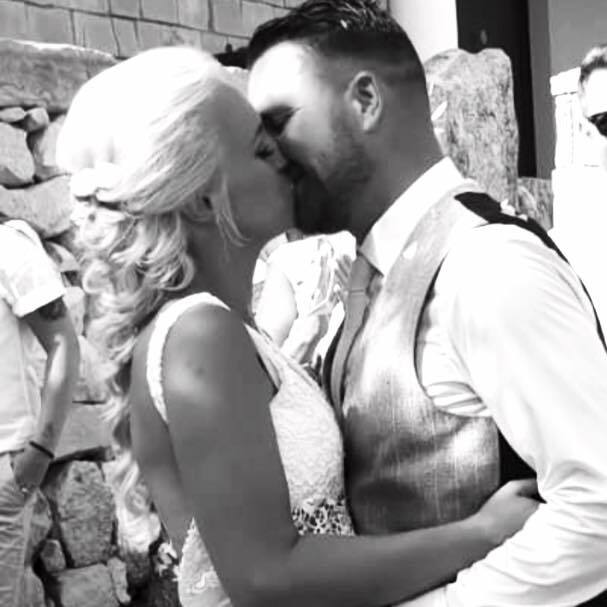 We have just returned from our fantastic wedding/holiday at Panorama and Oceania Villas. We had friends and family with us in the villas (25 of us) and it was simply amazing. The views are unbeatable – we couldn’t decide whether it was better in the day or at night! Poly and Sevinos are just fantastic. So helpful for anything that we needed to do with the villas and the local area. Highly recommend for a holiday or wedding! We got married in Paphos on the 29th September 2017. The entire bridal party, families and ourselves stayed in the amazing Panorama and Oceania Villas. The villas and owners Poly and Sevinos have a special place in our hearts. 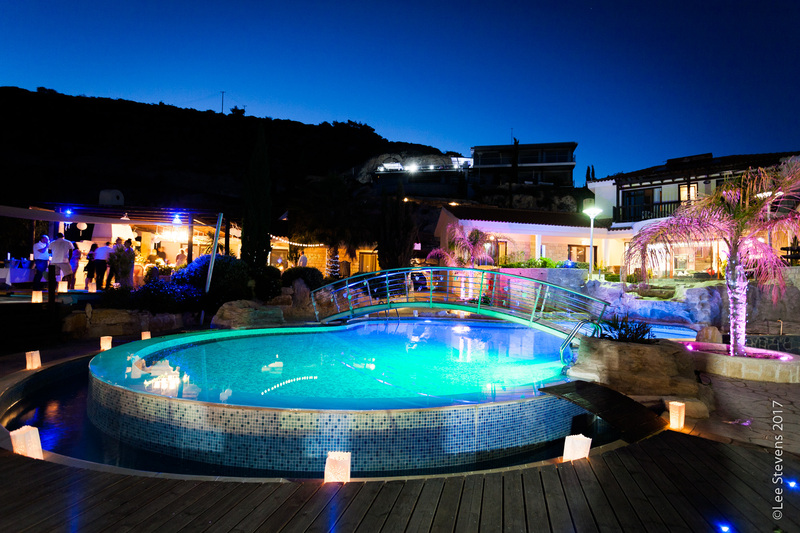 We would highly recommended staying and throwing your wedding in the Panorama and Oceania villas. It’s a little peace of heaven. Excellent villas, thoughtfully build and decorated with amazing views. The owners are friendly and easy to deal with.We had a friend get together at the villa for the weekend and we had great time, enjoyed the open space layout and how easy it make it for a big group of people hang out together while doing different activities. Recommended.